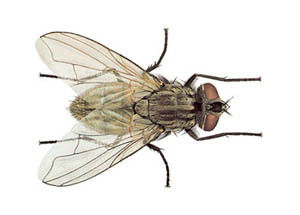 This is the most common fly occurring in homes, restaurants and other buildings. They do NOT bite and feed only on liquids which they produce by spitting saliva solid food to pre-digest it. Adults are 5 – 8 mm long, with one pair of wings and reddish eyes. The body is grey or yellowish and covered in hairs. Females are slightly larger than the males. The appearance of large numbers of adults, and the presence of creamy-white maggots about 6mm long on garbage or manure, are the most obvious sign of a fly infestation. In the case of a heavy infestation, deposits of saliva and faecal material (fly specks) can often be seen on walls and surfaces where the flies rest. Flies can transmit disease in humans and animals, including typhoid, cholera, dysentery, and tuberculosis. They pick up disease organisms whilst feeding on garbage or other noxious substances and then regurgitate saliva and waste onto human food and preparation areas spreading the disease. The life cycle of the House Fly, from egg to larva to adult, can be completed in as little as 7 – 10 days. House flies can produce as many as 12 generations in one summer. Adults usually live for 15 to 25 days but in cold weather the larvae and pupae can survive for several months in a protected, warm location. They will emerge as adults when the weather warms up. Good sanitation is the first step in all fly management, and the proper disposal of waste food and other materials on which the flies can lay eggs is a priority. Food should be covered or kept in suitable containers. Waste food and other household waste should be placed in plastic bags, sealed, and properly disposed of in dustbins which have proper fitting lids, are emptied and cleaned regularly and are sited away from the entrances to buildings. Fly sprays and papers can be used to control adult flies. Fly screens and electronic fly killers are often used in commercial premises to control flying insects including the House Fly.